Download "Curriculum Vitae. 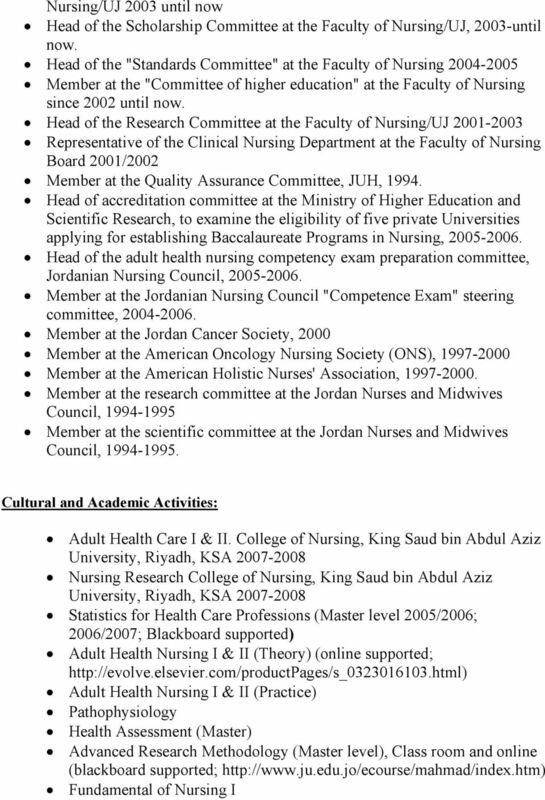 MSc (Nursing) University of Jordan, Amman-Jordan 1989-1992 BSc (Nursing) University of Jordan, Amman-Jordan 1982-1986 Experience:"
2 Jordan University Hospital-Amman, Jordan King Hussein Medical Center- Royal Medical Services, Jordan Staff Nurse at a special surgical floor (Uro. & Neuro-surgery) 50 beds capacity, and as a clinical teacher and research assistant for nursing students. a ward with 60-beds Staff Nurse at capacity and cases of general surgery, uro, thoracic, and orthopedic surgery. Publications: Nada Yasein, muayyad Ahmad, Fadia Matrook, Laeth Nasir, Erika Froelicher. Metabolic syndrom in patients with hypertension. Eastern Mediterranean Health Journal (Accepted, 2008) Ahmad, M. Muayyad & Alasad, A. Jafar. (2007). Patients preferences for nurses gender in Jordan. International Journal of Nursing Practice, 13 (4), Ahmad, M. Muayyad. (2005). Psychometric Evaluation of Cognitive Appraisal of Health Scale with Patients with Prostate Cancer. 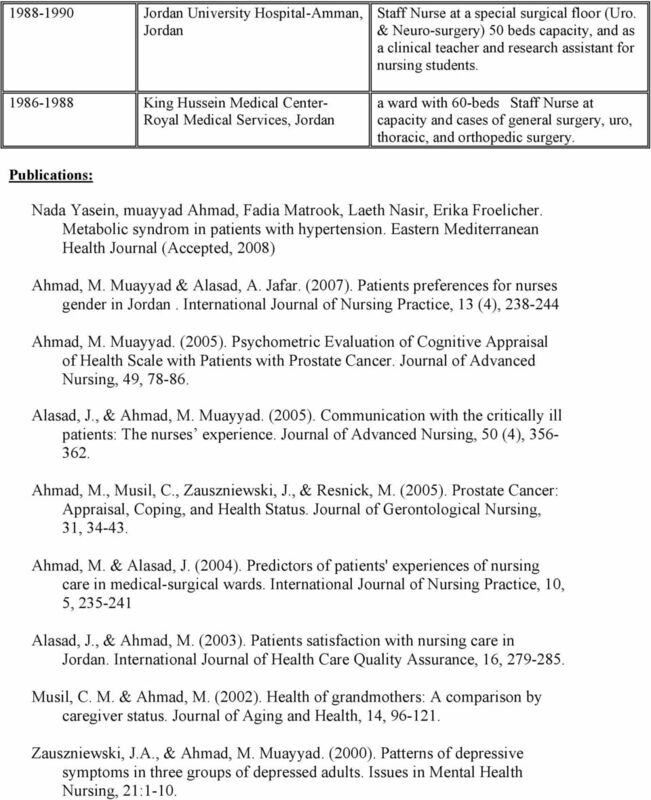 Journal of Advanced Nursing, 49, Alasad, J., & Ahmad, M. Muayyad. (2005). Communication with the critically ill patients: The nurses experience. Journal of Advanced Nursing, 50 (4), Ahmad, M., Musil, C., Zauszniewski, J., & Resnick, M. (2005). Prostate Cancer: Appraisal, Coping, and Health Status. Journal of Gerontological Nursing, 31, Ahmad, M. & Alasad, J. (2004). Predictors of patients' experiences of nursing care in medical-surgical wards. 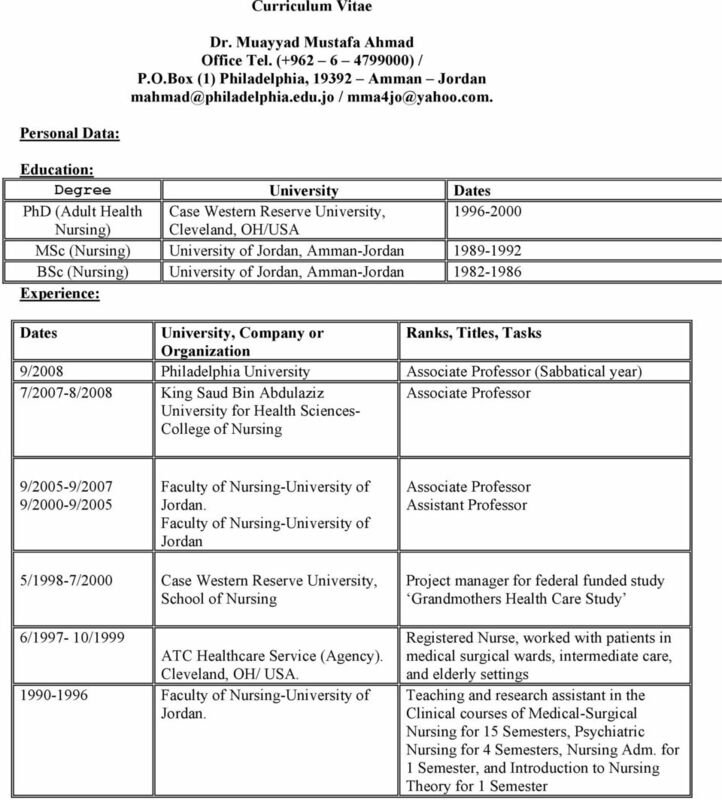 International Journal of Nursing Practice, 10, 5, Alasad, J., & Ahmad, M. (2003). Patients satisfaction with nursing care in Jordan. International Journal of Health Care Quality Assurance, 16, Musil, C. M. & Ahmad, M. (2002). Health of grandmothers: A comparison by caregiver status. Journal of Aging and Health, 14, Zauszniewski, J.A., & Ahmad, M. Muayyad. (2000). Patterns of depressive symptoms in three groups of depressed adults. Issues in Mental Health Nursing, 21:1-10. 5 Fundamental of Nursing II Awards & Merits: Winner of the Jordan Nurses & Midwives Council Research Award for the year 2006/2007. The 4th winner (Out of 590 papers) of the 2nd Asian Family Health Research Award, January 14, Tehran, Iran. Winner of the Distinguished Research Award in Medical and Pharmaceutical Scientific Field for the year 2005 Sponsored by the Ministry of Higher Education and Scientific Research-Jordan Member of the administrative team at the Faculty of Nursing; the winner of Al-Hussein Fund for Excellence for the programs of Nursing Member of the administrative team at the Faculty of Nursing, the winner of Al-Hussein Fund for Excellence for the program of Nursing Act as a Dean: Faculty of Nursing/University of Jordan during the vacation of the principal Dean and vice Dean. Sigma Theta Tau International, Alpha Mu Chapter, Case Western Reserve University, Dissertation Research Award, $500, (1999) Alumni Association at FPB-School of Nursing, Case Western Reserve University, Dissertation Research Award, $500, (1999). President of the Nursing Students PhD Council at Case Western Reserve University (CWRU) for the year 97/1998. 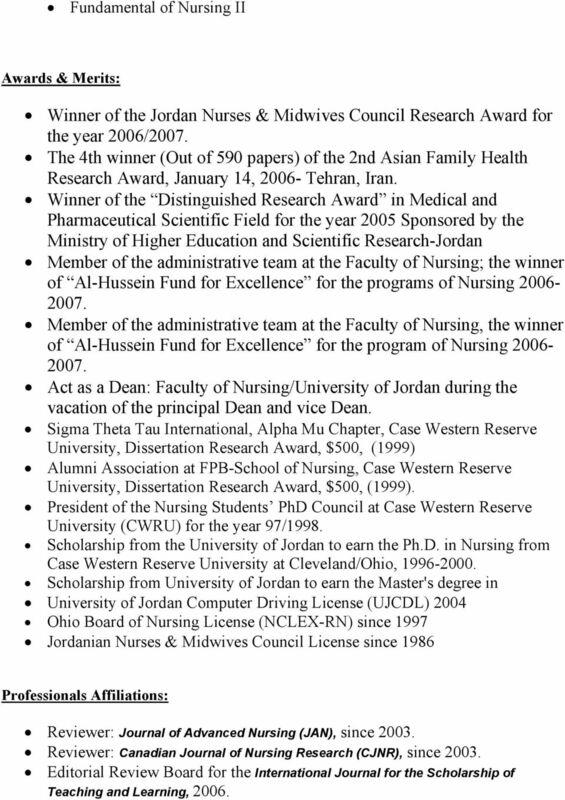 Scholarship from the University of Jordan to earn the Ph.D. in Nursing from Case Western Reserve University at Cleveland/Ohio, Scholarship from University of Jordan to earn the Master's degree in University of Jordan Computer Driving License (UJCDL) 2004 Ohio Board of Nursing License (NCLEX-RN) since 1997 Jordanian Nurses & Midwives Council License since 1986 Professionals Affiliations: Reviewer: Journal of Advanced Nursing (JAN), since Reviewer: Canadian Journal of Nursing Research (CJNR), since Editorial Review Board for the International Journal for the Scholarship of Teaching and Learning, 2006. 6 Reviewer for the International Journal of Doctoral Studies (IJDS), since 2006 Editorial review board: Interdisciplinary Journal of Knowledge and Learning Object, since 2005 Reviewer: Royal Medical Services Journal/Jordan, since 2005 Reviewer: Jordanian Medical Journal, 2006 Worked with the Ministry of Education in Jordan, as: o Expert reader for the "Pharmacology Book for Nurses" to the second secondary class school level. o Editor for the "Teacher Guide" for the Pharmacology Book for Nurses. CURICULUM VITAE Name: Arwa Fahed Zu'mot, M.S.N., R.N Birth Place: Amman Citizenship : Jordanian Work Address: University Of Jordan Faculty Of Nursing Amman - Jordan Tel: 5355000 /2491 Home Address: P.O. 1997-1999 M.S.N University of Windsor-Ontario, Canada Emphasis: Human responses and adaptation to alteration in health. Curriculum Vitae. General Information. Personal Information Gender: Male Social Status: Married Number of Children: Three. Campus email: tteasley@gsw.edu. If not, please indicate other justification for graduate faculty membership. See faculty handbook, Section II, B, I.
Pamela Giles: VITA. Core courses for PhD in Adult and Higher Education University of Oklahoma. Midwest Scholars Research Conference. Sarah Miller, EdD, MSN, RN Associate Professor of Nursing Accelerated RN-BSN Studies Program Director MidAmerica Nazarene University smmiller@mnu. Curriculum vitae. 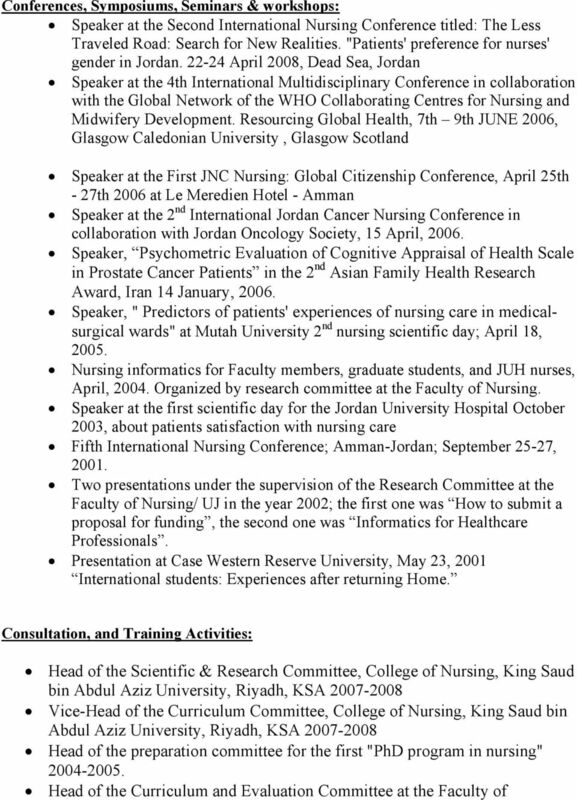 2010, Ph.D., Nursing Education, Faculty of Nursing, University of Alexandria, Egypt. Selected Invited Presentations. Keystone Health System Annual Nursing Research Symposium. The University of Cincinnati is an affirmative action/equal opportunity employer. CURRICULUM VITAE Diana M Crowell Ph.D. RN CNAA 5 Busdick Drive Kittery, Maine 03904 207 439-3801 www.leadingyourlife.com dcrowell@leadingyourlife. 1 Whei Ming Su Curriculum Vitae EDUCATION Master of Arts Degree. Major in Nursing Education. New York University, 1979. Bachelor of Science Degree. Major in Nursing. National Defense Medical Center, Taiwan. The University of British Columbia Department of Physics & Astronomy Graduate Program Policies and Procedures Sept 2011 Table of Contents 1. Introduction!... 4 2. Programs!... 4 3. Admissions!... 4 3.1.